Paul Weller Feature From Stuff.co.nz! – Paul Weller News! Paul Weller Feature From Stuff.co.nz! 3 Comments on Paul Weller Feature From Stuff.co.nz! Paul Weller adjusts his perfectly tailored trousers and Dolce and Gabbana shirt, reaches out to shake my hand, and greets me with his ”how are ya mate” English geezerism before sitting on a leather couch. I am trying desperately to stay cool, despite my rapid heart rate and nervousness at meeting a musical hero, the king of Mod culture and Brit-rock and inspiration to a generation of British bands like Oasis, Blur and Pulp. A Weller fan for, oh, 20 years, this brief interview is a career highlight. So, in an effort to establish my credentials without looking obsessive, I ask about an old Lambretta scooter he was pictured on for press shots an eon ago. ”It was an SX200,” he says of the bike. ”I gave it to be auctioned off about 10 years ago, for a teenage cancer trust. It was a thing Roger Daltrey (The Who) was sort of involved in, and it was at (London’s) The Royal Albert Hall in fact. They had the scooter outside the Albert Hall, being auctioned off…which I’ve subsequently seen on eBay, or some other auction site, which was guttin’, man, because it was a beautiful bike,” he says, frowning. Making his first visit to New Zealand in a long and distinguished career, 52-year-old Weller’s three shows at Auckland venue Powerstation sold out in hours, and he admits to being ”amazed, man”, unaware ”of what sort of audience I had here”. He accepts there’s an element of ”homecoming” for the high percentage of 40-plus ex-pat Brits who attend his gigs outside the United Kingdom and want to hear The Jam and Style Council songs. But, as if to emphasise the importance of his muse, Weller changed the set list for each of the three concerts to include material from 2008’s 22 Dreams and this year’s Wake Up The Nation. While his international success has been limited, he’s revered in his homeland, touring almost constantly, and has been referred to variously by British media as ”a national treasure” and ”a British cultural institution”. Wake Up The Nation has a subtle angry streak, and when quizzed about its nomination for Britain’s The Mercury Prize, he admits disappointment he didn’t win. But as for the 2009 Brit Awards Lifetime Achievement gong, he “didn’t really f***ing care mate, to be honest wif ya, know what I mean?”. ”If you look at it, the Spice Girls have won it,” he scowls. Weller’s also done and dusted with his once-strident political comment. He thinks ”it’s more important for us English people to get on with our lives, carry on with our culture”, and with hindsight admits the intention to Wake Up The Nation with the recent album ”might be a bit grandiose”: ”Can a pop record ever do that…possibly?”. ”I’m looking at it in an optimistic way, I think it might take a few years for it to settle down and become something else again. ”Quite a few years ago, before the advent of the downloading and digital thing, people were telling me – musician friends – ‘oh it’s gonna be great, we’ll be autonomous, we won’t need record companies’, but I still haven’t seen any evidence of that,” he says. The people who told him that 10 years ago ”aren’t selling loads of records, or being particularly autonomous”, he observes dryly, ”they’re still scratching around looking for record deals”. His current record company, Island, has begun reissuing older material in deluxe format (Wild Wood, The Jam’s Sound Affects), and Weller says ”they do a good job of it”. But again he admits to ”showing his age” when revealing he ”was always happy with a single, A and B sides, an album was an album, and that was it”. He doesn’t feel he’s embraced modern digital delivery of music, but ”whether or not I like it – and I don’t like it – that’s the way it is”. Weller now has an iPod, gifted to him by guitarist Steve Craddock, with ”a shitload of stuff on it”, although classical composer Debussy is the only thing he can remember. Spoken like a man after my own heart. Weller has always been known as a musician who is looking ahead – hence his frustration with answering repeated questions on The Jam and The Style Council, although a few of those bands’ tunes were among the weekend’s shows – and he confirms he’s written 10 songs for a new album. Weller is focussed on ”just enjoying my life really”, and while ”getting drunk and listening to loud (rock) music has gotta be up there” in terms of the good things in life, it seems ”being in love and gettin’ married” recently has given him a new energy. Asked what has kept him going, he responds: ”I just like doing what I do”. ”From the time I was 10 years old, I wanted to do music, wanted to be in a band. For anyone to get their wish in life, it’s an amazing thing. I put a lot of effort into it, and God knows I have done over the last 40-odd years. It’s like anything, you only get out of it what you put in…what you give is what you get,” he says, quoting a Jam lyric. Paul Weller’s Wake Up The Nation is out now on Island. I bought that Lambretta off of E Bay and I still have it, you can pop round anytime to check on it Paul!! 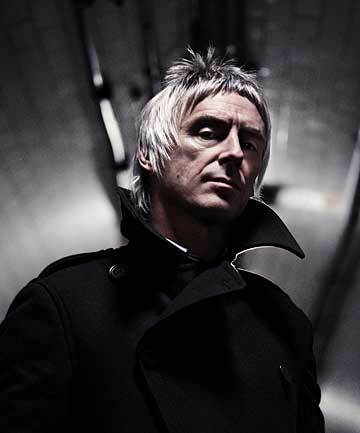 Previous Entry Paul Weller To Perform Outdoor Concert in LA For Jimmy Kimmel Live! Next Entry Paul Weller At The Power Station In Auckland, NZ (10-29-10) – A Fan’s Review!